For more good stuff, visit http://escondidograpevine.com. So, you want to throw a fastball. There are two kinds of grips: Two seam and four seam. First you have to get a grip on the ball. Put the fingers on top of the seams with the thumb underneath. Don’t choke the ball. Put it out between the two pads on the fingertips. The two seam grip starts with outing the two fingers on the seams. This grip makes the ball move somewhat. Infielder use the four seam grip to get better. they wrap the finger around the seams. People refer to the two seam pitch as a straight fastball. the pitch goes fast but has some movement. The most common grip keeps the fingers close together along the seam. The thumb touches the ball slightly. The more pressure applied with the index finger, the more movement on the ball. Two seam fastballs aren;t quite as quick to the plat as four seam fastballs. Analysts believe they’re several miles per hour slower. However, the movement factor makes the pitch just as effective. The more the pitcher spins the two seam grip as he throws, the more the ball moves. Breaks on the ball vary greatly depending on the pitcher’s arm strength and finger position. It’s a natural grip that is taught to players at an early age and remains usable throughout their careers. Four seam fastballs are a bit tougher to throw and are sometimes know as a rising fastball. They also bring the high heat with the rising ball coming in at the fastest possible speeds. This is the one pitchers hump on in the majors for 100 miles per hour. It’s designed for speed, not comfort. Challenging a batter at the purest reflex level, pitchers grip the four seam ball with index and middle finger across the seams, perpendicular to the digits. Grip the ball on top of the seam horseshoe pattern with the seams facing away from the body. Put your thumb underneath the ball the same as in the two seam grip. The back of the thumb should be lightly touching the underneath seam. The four seam ball is released with a straight-ahead motion. It can be thrown from any arm angle. As the ball slides off your grip;s middle fingers, it spins a little. The spin causes the ball to move as it rises in the strike zone. It’s designed to go straight through the strike zone. A lot of pitchers grow up throwing with this grip because the four seam fastball is the most reliable pitch in baseball and most natural for the wrist and arm. The key to throwing a great four seam baseball is the grip. Hold it like an egg in your grasp. Maintaining a gap between your hand and the ball is important. Keeping a loose grip on things keeps friction off the hand to a minimum. The ball goes faster with less friction. Back to the two seam grip, it needs to create more friction to maintain greater ball movement. That calls for a tighter grip. This makes the horsehide run in and back up aligned with the throwing hand motion at speeds of one to three miles per hour slower than the four seam grip. If you’re a right-handed pitcher, throw the two seam ball to the right of the plate and the four seam fastball to the left glove side. This makes the break tail away from hitters. Left-handed pitchers grip and throw the ball to the left for the two seamer and right for the four seamer. When it coms to throwing a fastball, the grip boils down to comfort level, hand size and personal preference. Some pitchers mix and match grips depending on situations. It all boils down to which grip fits you best. The four seam fastball will overpower hitters. The two seam fastball will get there almost as fast with a sink and a twist. Palomar College has one of the top junior college baseball programs in the nation. Now it has a $10.2 million baseball complex second to none if the JUCO world. The brand spanking new baseball complex opened play on Jan. 27 with the Palomar Comets taking on the College of the Desert Roadrunners. A brief ribbon cutting and ceremony preceded the game. Baseball and Palomar sports lovers can thank local voters for the new digs. Proposition M bond measure passed by voters in November 2006 raised $694 million to improve the San Marcos campus, the satellite Escondido campus and build a new Fallbrook campus. Tyler Saladino batting for the Palomar Comets. The new complex features a natural turf field with a subsurface drainage system, artificial turf foul territory, stadium-chair seating for approximately 300 with additional upper seating on an artificial turf slope, seven full batting cages, five bullpen mounds, an elevated press box with a state-of-the-art public address system, and a designated warm up area with artificial turf. The facility replaces aging Myers Field just off Mission Road which originally was constructed in the early 1950s by the late Palomar head coach Ward “Rusty” Myers, his players and volunteers. 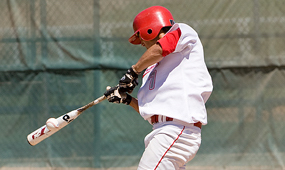 Palomar College is known for its baseball program. Darren Balsley, the longtime acclaimed San Diego Padres pitching coach payed there. 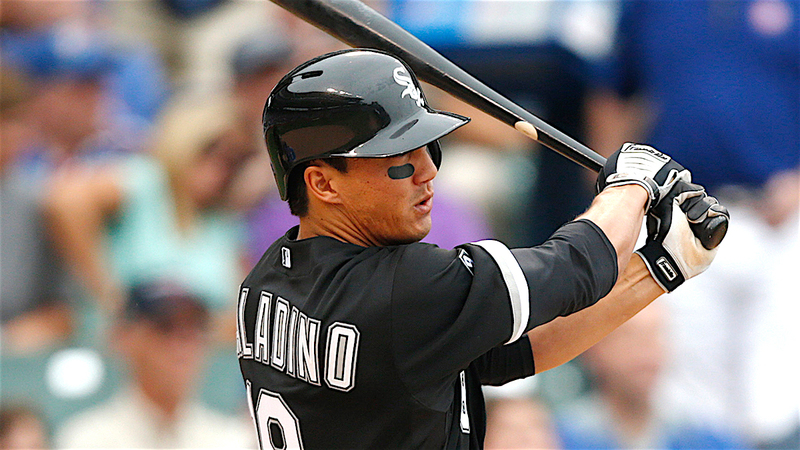 So did Nick Vincent, a Padres pitcher, as did Tyler Saladino, Chicago White Sox third baseman. Troy Afenir a catcher with the Houston Astros, Oakland A’s and Cincinnati Reds; third baseman Randy Johnson — the OTHER Randy Johnson — of the Atlanta Braves; George Hinshaw, second baseman with the Padres and Los Angeles Dodgers; Jim Scranton, a Kansas City Royals shortstop. Another seven former Comets now are on MLB rosters. Too many former players to name here made it to the Minor Leagues. Twenty currently are in the minors. Among Palomar’s many baseball honors: California State Tournament Runner-Up 2005; South Central Conference champions 1957, 1962; Pacific Coast Athletic Conference champions 1988, 1989, 1993, 1998, 1999, 2000, 2003, 2005, 2006, 2009, 2011, 2012, 2013, 2014. Palomar College’s baseball team has won five consecutive Pacific Coast Athletic Conference championships and is ranked No. 2 in Southern California in the preseason. Palomar last year was ranked second in the nation by Perfect Game USA entering the California Community College Athletic Association State Championship Final Four in Fresno. The Comets finished third in the state tournament behind champion Orange Coast College of Costa Mesa and runner-up San Joaquin Delta College of Stockton.